Many wondered “What has happened to the author of “In the crossfire”?” as they read the book’s last sentences leading to Samar Yazbek’s exile. “In the crossfire”, which got translated into many European languages, was awarded the PEN Pinter prize, the PEN Tucholsky prize, and the Oxfam Novib prize, within months after its publication. 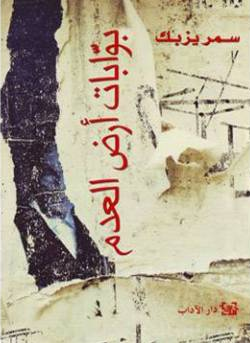 In her new book, “Crossing Into The Void, the Syrian novelist tackles Syria once more. Unlike “In the crossfire”, mainly written in the urgency of the need for a document that would testify day after day to the unbelievable events in Syria, “The Crossing is a powerful literary narrative. After she was forced to exile in July 2011, Yazbek naturally embraced the cause of the Syrian revolution. From Paris, where she now lives, she watched the peaceful uprising turn into a bloody armed conflict. Baffled by the coverage of the international press, perplexed by the world’s mutism and passivity, she carries the message of her people around the world, taking part to conferences, closed political discussions, talk shows, written interviews, radio broadcasts, anything that would shed some light onto the events which are shamefully reduced to a simple sectarian conflict by the Western press.. Starting the summer of 2012, Samar Yazbek makes several clandestine visits to Syria. Passing through a hole in the fence with the Turkish border, she gets into what can be called “Liberated Syria”, the Northern area under the control of the rebels. Beyond her personal urge to be close to her people and homeland, Yazbek has a purpose: help however she can. She gets involved in building schools and economically empowering widows, she meets regularly with rebels to argue for the necessity of a civil society, and going as far as the front lines, she documents the daily horrors so nothing is forgotten or overlooked. To us viewers who watch the news in disbelief from the comfort of our homes, the notion of living for months on without water, or electricity, even without food on some occasions, sometimes in what used to be a house, often in basements and caves, is beyond our grasp. Over and above the alarming humanitarian crisis, violence occurs on a daily basis, several times a day. It takes many faces, be it in rockets fired at civilian populations, or metallic barrels stuffed with dynamite hurled at the population, or even Islamist factions condemning and executing civilians. Samar Yazbek has witnessed how a prosper land is turned into a land of destruction, a land of nothingness, where human limbs are picked up from the dirt to be buried. Women with incredible courage help the fighters. When they don’t join the military rebellion, they are behind the scene, smuggling medicine, coordinating actions, filming operations, writing testimonies. In an effort to maintain some normality, they will defy bombardments and walk their children to school through the rubbles. Beyond the horror and the civilian resistance, there also are the fighters. Who are these men? Some belong to Islamist factions, others are part of the Free Syrian Army, some are civilians who took up arms to fight for their dignity and freedom. They are all the different faces of the rebellion, a disarticulate, spontaneous reaction to state violence and injustice. Yet, some are alien, like the radical Islamist factions of ISIS, while others, like Jubhat al Nusra and Ahrar al Sham are the off-shoot of the pain and despair of the Syrian people. Having met with the leaders of both Jubhat al Nusra and Ahrar al sham in Idlib, North of Syria, Samar Yazbek portrays these men, their vision, and determination. She also ponders on the the revolution’s transformation, and its apparent islamisation, explaining it from her insider’s perspective. In the midst of this madness, Samar Yazbek herself is torn. “Exile” takes on a meaning she had never suspected. Exile is not being someplace else, like most of us would believe. Exile is being obsessed with home when she’s abroad, “on the outside”; it is also being constantly reminded that she no longer lives here, when she’s “inside” visiting her homeland and friends. Exile is belonging nowhere, as if in a limbo where time bleeds. Taking these four themes as points of focus (the humanitarian crisis, the role of women, her personal conflict, and the fighters), “Crossing Into The Void”, is the narration of the ongoing Syrian revolution, and its transformation into a monstrous conflict, as it is experienced by the novelist. There are three layers to the narration. The first layer follows the temporal structure of the book which is determined by Samar’s three visits to the North of Syria, starting with her first visit in the summer of 2012, and ending with her last in the summer of 2013. The second layer is triggered by Samar Yazbek’s being the narrator of the story. Through her eyes and skin, we discover the pain, despair, and hope she experiences. Finally, the third layer is that of history: the development of the Syrian revolution, in which the author closely follows the different faces of this change, and explore its causes. With Samar Yazbek, the reader understands the mechanisms of the war. How did we move from peaceful demonstrations to armed conflict? Why do moderate men join forces with radical Islamists? Who are these foreign fighters who have grown powerful in such a short period of time? Crossing Into The Void are none other but the passage points through which Samar Yazbek goes in and and out of Syria. The first part of the book, “The first crossing” (August 2012) describes mostly civilian strife. The second crossing (February 2013), focuses on the rebels and civilian resistance. The third crossing (August 2013) explores and explains the visible islamisation of the uprising. Following the transformation of the revolution in time, each of the book’s Gates, or Crossings, seems to tackle one of its aspects. Yet, throughout the book, the main characters remain constant. These characters, like in a novel, although none of them is fictive, hold the narrative line together, and provide the reader with a deeper understanding of the tragedy. In The Crossing, Samar Yazbek tells what cannot be told. She lends the reader her amazingly penetrating eye, and captures deep snapshots of the Syrian reality. The barbed wire lacerated my back. I was trembling uncontrollably. After long hours spent waiting for nightfall, to avoid attracting the attention of Turkish soldiers, I’d finally raised my head and gazed up at the distant sky, darkening to black. Under the wire fence marking the line of the border a tiny burrow had been dug out, just big enough for one person. My feet sank into the soil and the barbs mauled my back as I crawled across the line of separation between the two countries. I took a deep breath, arched my back and ran, as fast as I could, just as they had told me to do. Fast. Half an hour at a sprint – that’s the distance you have to cover before you’ve safely crossed the border. I ran and ran until we were out of the danger zone. The ground was treacherous and rocky, but my feet felt light as I sprinted. The pounding of my heart carried me, lifting me up. Panting, I muttered to myself: I’m back! This isn’t a scene in a film, this is real. I ran, mouthing, I’m back . . . I’m here. the other side towards the waiting car. On this occasion my guides and I weren’t part of a convoy of strangers. At the time I didn’t even know if I would ever manage to write about it later; somehow I’d just assumed I would die, like so many others, when I returned to my homeland. Darkness settled in for the night and everything seemed normal, as expected, or so it seemed. Later on, after I had made this crossing a number of times over eighteen months, I saw many changes: the chaotic state of Antakya airport, near the border, would be ample evidence of what was happening to Syria. I stowed it all away in the back of my mind, along with everything else that testified to the rapid and profound upheavals taking place in my country. Back then, though, I was ignorant of what was to come as I scrambled down the hill for the first time, my legs throbbing with pain. When I reached the bottom, I crouched down and paused for at least ten minutes, wheezing and gasping for breath, trying to calm my beating heart. The young men accompanying me must have thought I was emotional at seeing my homeland again. But that was the last thing on my mind. We had been running for so long, I felt like my lungs were being wrenched from my body and I couldn’t stand up. Finally, we reached the car and I started to breathe normally again. I sat in the back with the two men who would be acting as my guides, Maysara and Mohammed.